Thomas Edison’s got nothing on the innovators at Amaryllo. In the name of science security, Amaryllo has developed a truly wireless camera that screws into—and is powered by—your everyday light socket. Blown away? Yeah, so were we when we came across the iCamPRO Deluxe at ISC West. Seriously, nothing like it exists on the market right now. It’s the only truly wireless camera that we know of that doesn’t require batteries. The idea blows me away and could potentially change the wireless security camera industry. That being said, as we dove into the iCamPRO Deluxe a little further and got over our initial amazement, we found a few things we’d like to see added or tweaked to make this innovation truly shine. Summary : With a few minor tweaks in size, functionality, and some motion tracking fine tuning, we feel iCamPRO Deluxe could potentially be a great option for a DIY home security camera. What’s different about iCamPRO Deluxe? 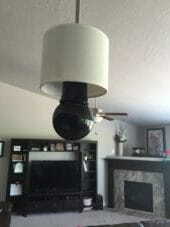 It’s a security camera powered by a light socket. Once you get over just how cool this idea is and examine iCamPRO Deluxe under the microscope, you’ll see that the major innovation is not the camera itself but the addition of the light bulb base. The camera is identical to Amaryllo’s iCamPRO FHD (available on Amazon), simply with an attachment that allows it to be powered by a light socket. How much does iCamPRO Deluxe cost? Amaryllo offers two cloud storage service plans to store your video footage. Subscribing to Amaryllo services will drop the upfront cost of the camera itself and give you a price break on your subscription price if you sign up for the yearly plan. The Gold Plan offers unlimited video storage for 30 days for a monthly subscription of $9.99. Signing up for the Gold Plan drops your upfront purchase price to $199. The Platinum Plan costs $14.99 per month, and gives you 365 days worth of unlimited cloud storage. Inside the box you’ll find just two components: the light bulb base and the camera sphere. 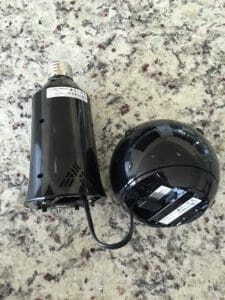 The light bulb base connects to the camera using a micro-USB cable and attaches with a small Phillips-head screw. Connecting the two components together was extremely easy and took me less than a minute. Simply select which Amaryllo device you are installing. Plug your camera into a power source. In this case, screw it into the light socket. Make sure your phone is connected to Wi-Fi. Hold the QR code in front of the camera lens to connect. I’ve never tested an easier product to install than the iCamPRO Deluxe. Total setup time took roughly two minutes. The Amaryllo app makes it easy to pair your camera with your mobile device by supplying a QR code that you simply hold up in front of the camera lens and let the technology do the rest. A lot of customer service issues can be solved in the design stage before the product ever hits the shelf. Amaryllo has designed a product so simple to install that, barring any technical malfunction, you shouldn’t need to contact them at all to get your camera to work—which I love. However, should you have difficulty, Amaryllo has a fantastic support page with step-by-step instructions and videos. The iCamPRO Deluxe boasts full 1080p HD video quality. I were very impressed with the image quality for both daytime footage and night vision. Both settings produce a clear picture and would allow you to positively identify anyone captured on camera. Keep in mind that high-resolution footage eats up your storage space in a hurry. You can downgrade your footage quality through the Amaryllo app to 720p or 480p so it doesn’t take up so much space. Amaryllo isn’t your average home security camera manufacturer. It is the pioneer in home security robotics, and it is this patented technology that’s on display in the 360-degree motion tracking camera. The app allows you to set a home location—the spot you want your camera to monitor primarily—and provides a “Go Home” button that will direct your camera to return home if it’s not fixed on that spot already. 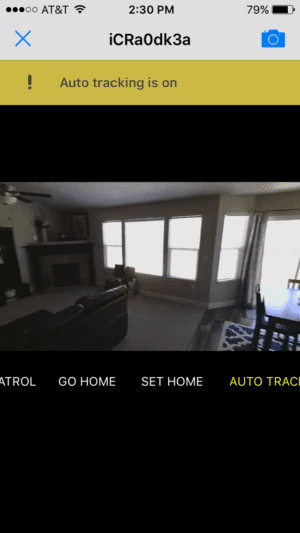 Patrol mode continuously scans the room the complete 360 degrees. When I tested patrol mode, it honestly felt like it was scanning too quickly, and there was about a 5- to 10-second delay from where the camera lens was pointing to what was appearing on my screen. Auto tracking will detect any movement in the room and follow the source as long as it continually detects motion. Other than the light bulb base, this is the main draw for iCamPRO Deluxe, but it unfortunately left me wanting. 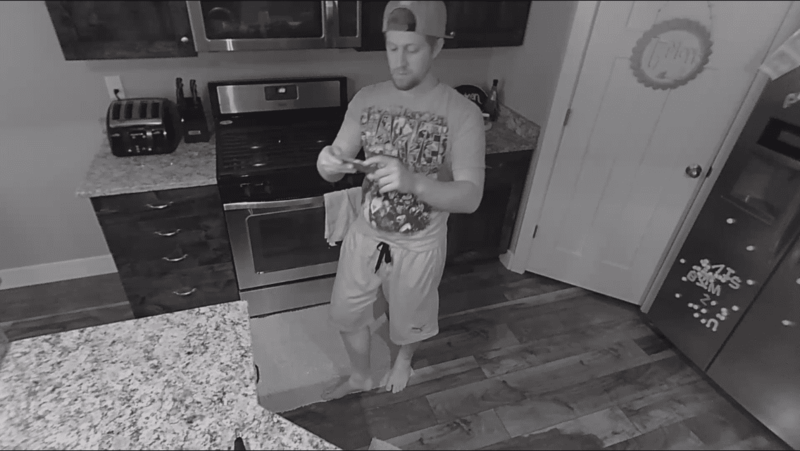 I installed the camera in a pendant light above my kitchen island so I could walk completely around the camera to see if it would follow me. I’m disappointed the motion tracking did not live up to my expectations. 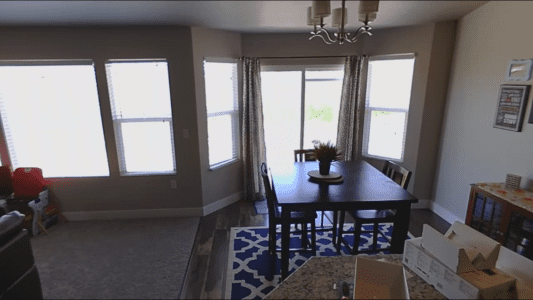 My kitchen/living room area has multiple large windows and each time I walked passed the windows, the auto tracking would get confused. It stopped tracking my movement and seemed to lock onto various movements outside—the wind was blowing over a wheat field behind my house. So I tried closing the blinds but the motion tracking still lost me as I walked past the windows. I also noticed that it kept trying to target the mirror hanging in the kitchen. It seems to me that the motion tracking is too sensitive and might be confusing the camera, making it unable to determine which motion to follow. I never got it to work smoothly, which was a huge downer. There’s also a significant delay—4 or 5 seconds—in the motion tracking. I was easily able to outpace the camera and stay out of the field of view. 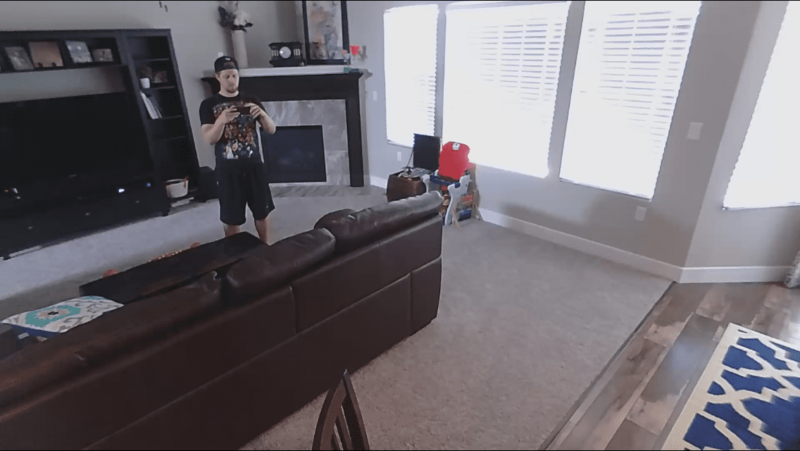 If an intruder sees the camera, they can avoid being seen fairly easily. Something that seems to have been lost in the big idea of having a security camera fit into a light socket—which is so awesome—is simple practicality. My house does not have enough lighting to be able to sacrifice even a single bulb. 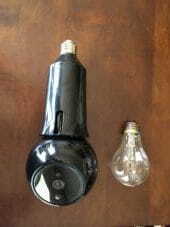 It’s very apparent when a bulb has burned out, drawing attention to the socket that has gone dark. The iCamPRO Deluxe emits no light at all which means you have to sacrifice light to add this camera to your home. I’d like to see an option that has some kind of LED bulb on the bottom of the camera so you don’t have to sacrifice lighting. Since the whole device is powered by your light socket, it can be turned off by simply flicking a light switch. The iCamPRO Deluxe doesn’t exactly blend in. This thing is huge at 10 inches tall and 3.54 inches wide. Here you can see it next to the standard incandescent bulb it replaced. Subtle, right? I was actually a little nervous plugging it into my pendant light because of its weight. It held up just fine, but it’s still an eyesore. I don’t think the white version would have helped much either. I’d like to see Amaryllo shrink this down by half if possible. As it stands, it’s not exactly incognito. Currently there are no user reviews for the iCamPRO Deluxe (light socket version). However, the camera technology is the same as for the iCamPRO so we’ve included some user reviews for that model. We will update as user reviews for iCamPRO Deluxe come to light socket. Wonderful camera! The motion follow works great. Only issue is sometimes I don’t get some of the videos sent to google to upload. It might just be me but I need to figure that out. The camera as a whole has a great picture but the motor is loud and mine just seems to get louder over time. You also cannot use it with Blue Iris and I’m guessing, no other home security software which makes it next to useless for me – I have 5 other cameras on my Blue Iris, so not a lot of use to have a separate system to monitor one sections. There is no reason they can’t add support to stream via a DIRECT webpage so you can use it in Blue Iris / etc..
Do we recommend iCamPRO Deluxe? As you can probably tell, we’re really geeking out about this idea and are super excited to see where Amaryllo takes the iCamPRO Deluxe. However, the motion tracking glitchiness raises some red flags. The practicality issues that iCamPRO Deluxe presents also prevent us from recommending this product wholeheartedly. 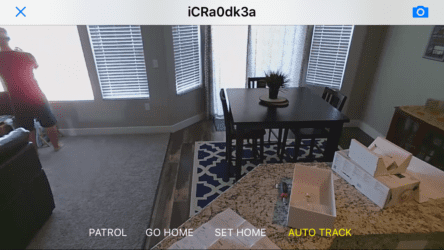 With a few minor tweaks in size, functionality, and some motion tracking fine tuning, we feel iCamPRO Deluxe could potentially be a great option for a DIY home security camera. Until then, it’s just a really bright idea.